Tina Ketchopulos, Community Relations Coordinator at Addison Gilbert Hospital, serves desert Tuesday during the first "Senior Supper" in the hospital cafe. 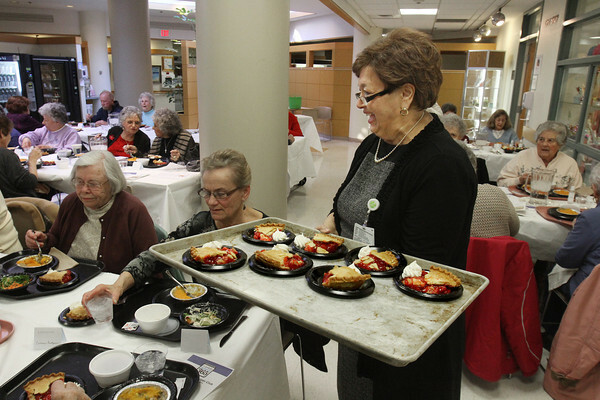 The dinner kicked off a series of events to be hosted by Addison Gilbert and the Unidine hospital food service corporation, in partnership with the Gloucester Police Department and Rockport and Gloucester senior centers, to promote better nutrition for seniors. Addison Gilbert Vice President Cindy Cafasso Donaldson spoke at the event, which was attended by about 40 seniors from Gloucester and Rockport, along with Gloucester Mayor Carolyn Kirk and City Councilor Safatia Romeo-Theken.